Learn simple, low-cost ways to expand your knowledge, enhance your skills and make a big difference in your organization’s communication. Looking for some communication inspiration? A handy, easy-to-use guide for communication inspiration. Writing in a clear and entertaining style, author Jane Shannon shows you simple, effective ways to build your knowledge, work smarter and improve how you communicate with employees—steps you can take without asking anyone’s permission. A page-a-piece, easy-to-digest tips and pointers that you can immediately put into action. Jane spent much of her career as vice president of HR Communication at Citibank. She then worked as a senior communication consultant at Davis & Company and as a principal in the communication practice of William M. Mercer, Inc. Her clients have included Texaco, Barnes & Noble, Bank of America, and United Distillers & Vintners. 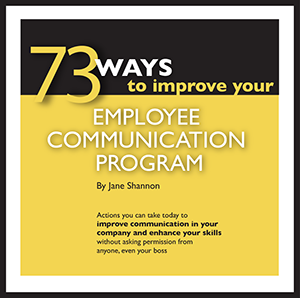 She authored 73 Ways to Improve Your Employee Communication Program.